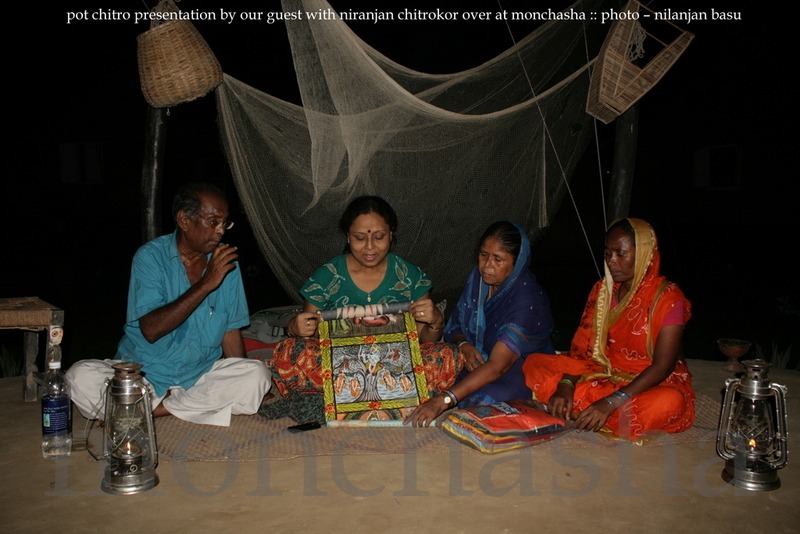 A story telling performance in the form of rhythmic songs by showing their own hand crafted pictures of gods is the most important rural art of Bengal. 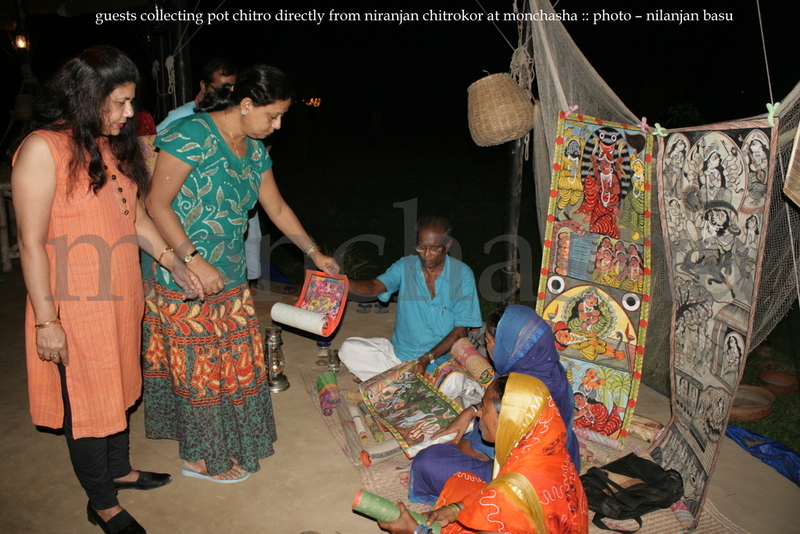 The picture is called as “Pot Chitro” – a traditional and rural art form of Bengal since middle ages. It is also a tool of villager’s entertainment solution. Amazing! 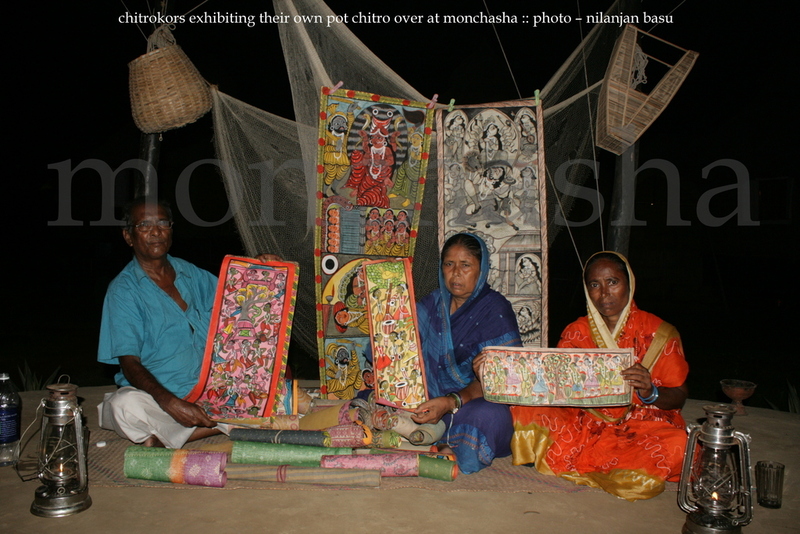 The painter is called as “chitrokor” or “chitrakar”. In most of the cases the painters act role of a poet and present ancient mytlogical stories related with gods of india. On a cloth based canvas the artists portrayed these verses with natural colours and motifs. The age-old folk art survived centuries to tell the tale. The most important thing I have noticed is that – most of the chitrakars in the village are muslims. These Islam based people present stories based on popular hindu mythology. So an artform here is acting a bridge between these two relegion. Please explore this art. You may find some new concept. 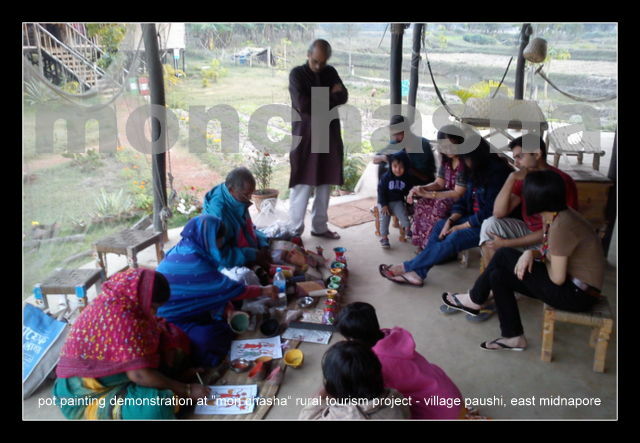 Over at “monchasha” we have started this type of workshop on demand. 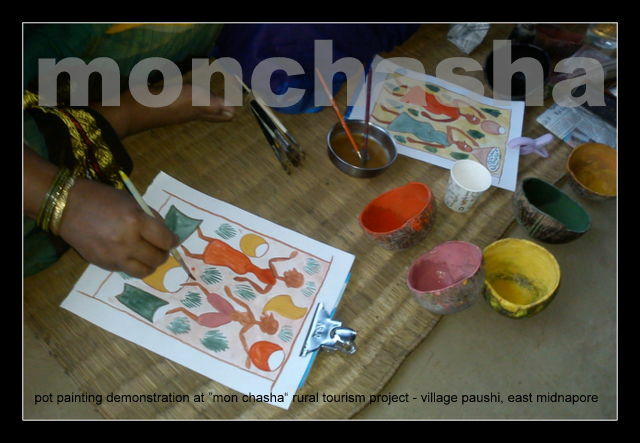 Please be with “monchasha” and help to survive this rural artform of bengal. Thanks. 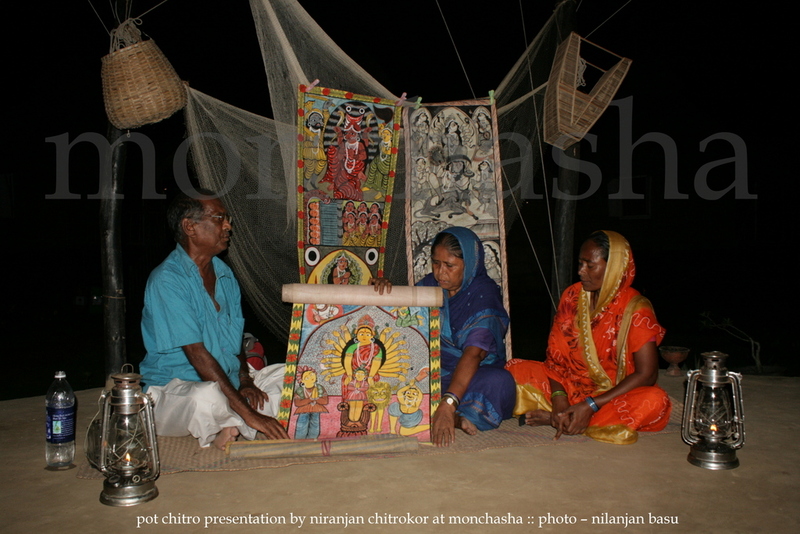 A story telling performance in the form of rhythmic songs by showing their own hand crafted pictures of gods is the most important rural art of Bengal. 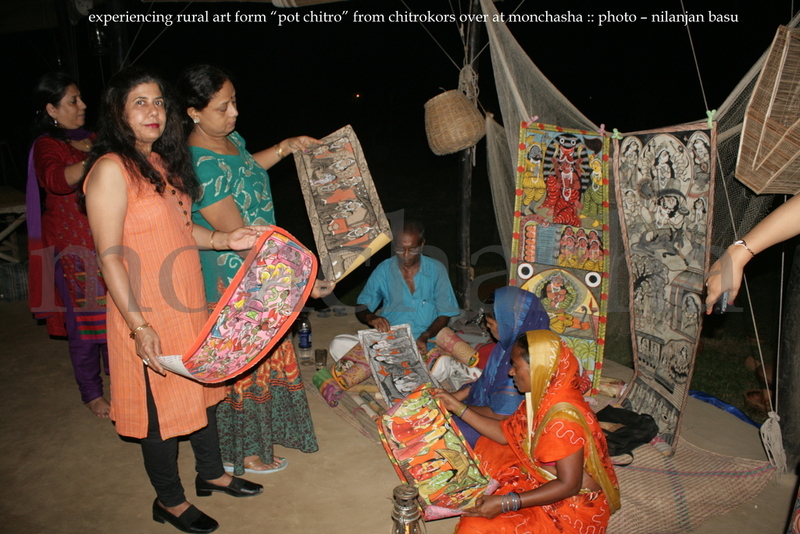 The picture is called as “Pot Chitro” – a traditional and rural art form of Bengal since middle ages. It is also a tool of villager’s entertainment solution. Amazing !! 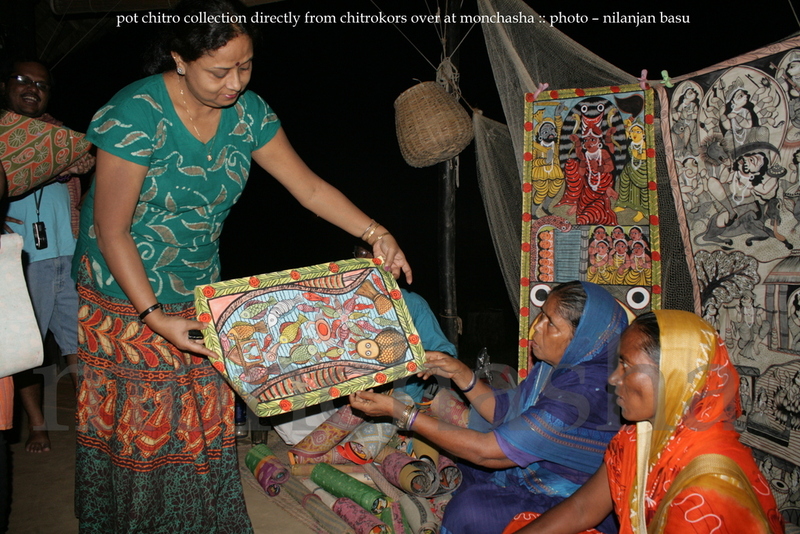 The painter is called as “chitrokor” or “chitrakar”. In most of the cases the painters act role of a poet and present ancient mytlogical stories related with gods of india. On a cloth based canvas the artists portrayed these verses with natural colours and motifs. The age-old folk art survived centuries to tell the tale. Here in this picture Niranjan Chitrakar is showcasing his paintings to us. 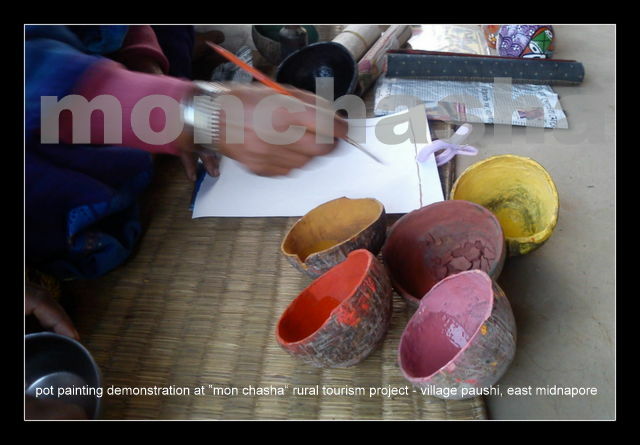 Contact for a gorgeous show over at “monchasha” during your stay.